How Is Anti-Reflux Surgery Carried Out? 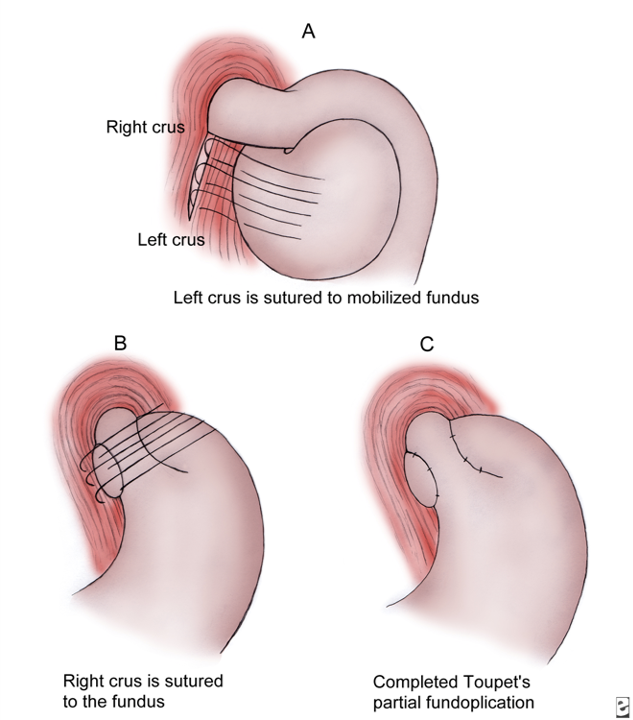 Modern techniques utilising minimally invasive and key hole surgical techniques have revolutionised the treatment available to sufferers. 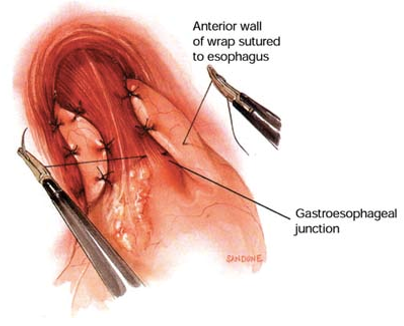 Laparoscopic anti-reflux surgery (also referred to as Laparoscopic Fundoplication) is performed to surgically reinforce the “valve” between the oesophagus and the stomach, by wrapping the upper portion of the stomach around the lowest portion of the oesophagus. 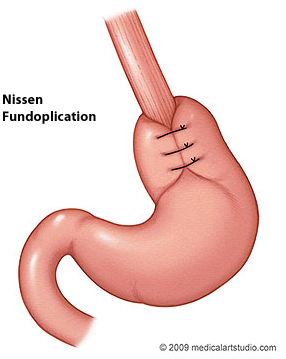 There are three types of fundoplication: A Nissen 360 degree wrap, A Toupet 270 degree posterior Wrap and A Watson 180 degree anterior wrap. Your surgeon will discuss the individual merits of each with you. In a laparoscopic procedure, a small incision (5 to 10mm) is used to enter the abdomen with a canula (a narrow tube-like instrument). Another instrument called a laparoscope, is then inserted through the small incision (key hole surgery) and connected to a camera, giving the surgeon a clear and magnified view of the patient’s internal organs. 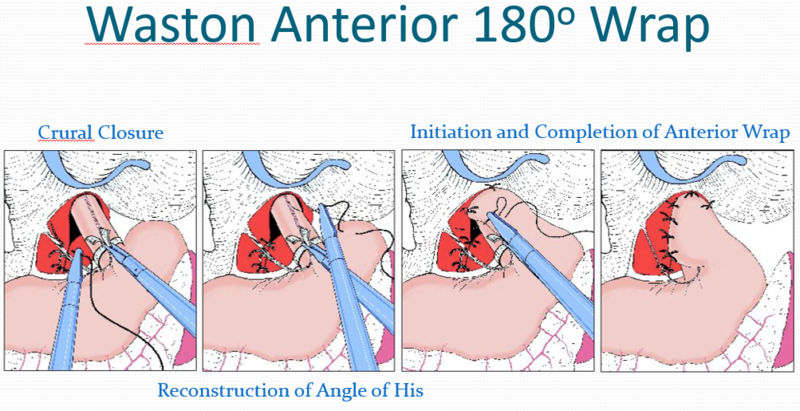 The procedure to reinforce the valve is then performed from “inside” the abdomen through a key hole incison after expanding the available space by pumping carbon dioxide gas into the abdominal cavity. What Are The Expected Results After Anti-Reflux Surgery? What Is The Recovery Like After Anti-reflux Surgery? The post-operative pain following this procedure is generally mild, although some patients may require pain medication. It is not usual for further anti-reflux medication to be required after surgery. Patients are encouraged to engage in light activity soon after surgery and discharge home within 1-3 days after their procedure. There may be some modification of diet required initially after surgery, beginning with the introduction of very liquid like food, followed by gradually introducing soft and then more solid food. Normal activities can be resumed within a short amount of time and recovering patients should expect to be back at work and driving within 2 weeks of surgery. 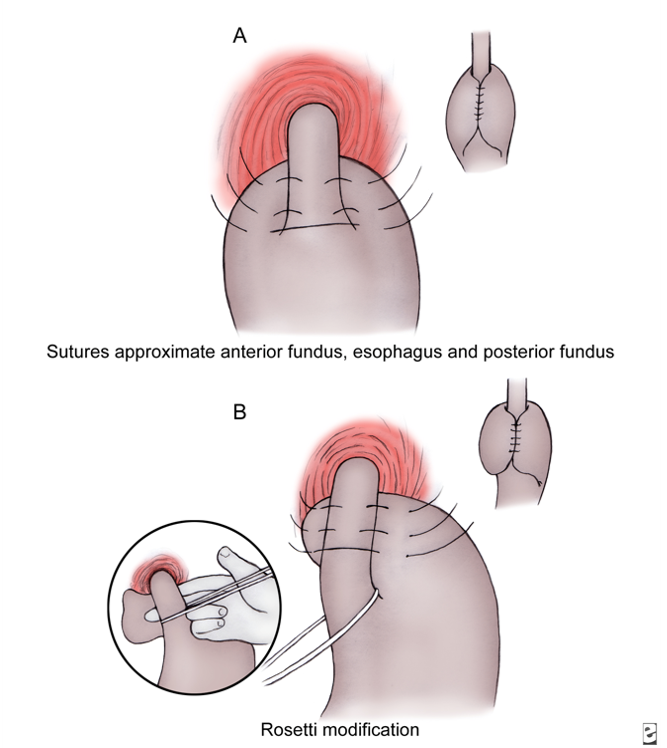 Are There Any Risks Associated With Laparoscopic Anti-Reflux Surgery? All surgery involves an element of risk from developing complications. Risks such as bleeding, delayed healing, scarring, infection, nausea and vomiting or injury to the oesophagus, stomach or spleen will all be discussed openly at consultation, as well as the scrupulous efforts taken to manage and minimise these risks to their lowest possible potential. Smoking will adversely affect wound healing and smokers may be precluded from having this type of surgery. Although Laparoscopic Anti-Reflux Surgery is regularly performed without any complications, all surgery, no mater how expertly or carefully it is performed, carries risks and the importance of a full evaluation and consultation with your surgeon to discuss your understanding and expectations in relation to these risks cannot be over emphasised. How Do You Find Out If I Am A Suitable Candidate For Surgery? If you wish to find out if you are a suitable candidate for Gastro-Oesophageal surgery, our Consultants will carry out a full evaluation of your individual needs and circumstances and provide you with a comprehensive verbal and written explanation of any recommended treatment or surgery. At Reflux.Surgery we understand the importance of the surgery you are contemplating and throughout your consultation you will be encouraged to ask as many questions as you wish and to take your time in making a decision to proceed with any treatment or not. At consultation you will be given both detailed information about the treatment options you are suitable for and encouraged to ask as many questions as you would like. If after careful consideration you decide to have anti-reflux surgery, then you will be treated swiftly at a time schedule to suit your personal needs and obligations. If you would like to find out more about anti-reflux surgery and discover if you are a suitable candidate for this procedure, please telephone or complete an enquiry form to organise a consultation appointment.